When I was a kid, I took everything apart. I dissected our Merlin handheld game, a Simon game that someone gave us, and my brother Paul’s Tomy Pac Man game. I disassembled basically everything I could find that I could open up with a phillips screwdriver. If you were electronic or mechanical based, and in my house in mid 80’s, you would have been nervous. Some of the things I took apart even went back together, and a subset of them even still worked afterwords. I went to Central Michigan University in pursuit of a Computer Technology degree, which had both Electronics Engineering and Computer Science focus. 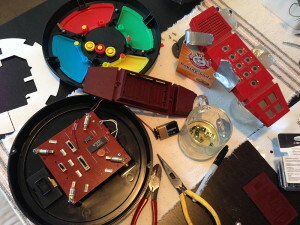 Aside from my job fixing arcade games and stuffing the stuffed animal cranes at Denny’s all around Orlando, I haven’t thought much about circuits, soldering, or flashing chips in many years. I have sat on the sidelines for the recent maker renaissance, I bought a few Make Magazines here and there, and even had Sherry buy me a Radio Shack learn electronics kit for Christmas one year, but buy and large I have just been lurking. My 12 year old son, Cole, wanted a gaming computer for Christmas. I figured instead of just buying one off the shelf, it would be worthwhile for me to teach Cole how to build his computer so he wouldn’t be scared of it and consider it a disposable piece of electronics. When something breaks, you figure out what and replace it, not throw the whole thing in the trash and buy another one. One by one, Cole opened his presents with confusion and uncertainty as we had individually wrapped each of the parts and components of the computer. It wasn’t until he opened the video card that he realized they were a gaming computer. We spent the better part of the long weekend assembling the gaming rig. That is all it took, I was hooked again. I started playing with that Radio Shack electronics kit, I picked up a couple of learn to program books for Cole, and started reading 2600 magazines again. 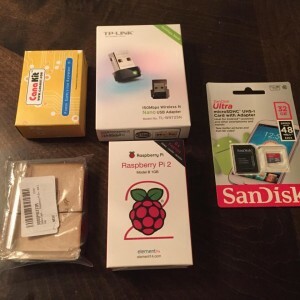 With my new found passion, I decided to buy the newest Raspberry Pi 2 computer, which has just been released. I chose the Pi over others such as the Arduino because it is both a fully functioning computer that can run Linux (and gasp, the new Windows 10), as well as a extensible platform for do it yourself kits and electronics experimentation. I must tell you, since I originally drafted this note I have started to spend more and more of my hard earned money buying accessories, books, and prototyping supplies for the Raspberry Pi. It is a slippery slope. If you think you are getting into this on the cheap because it is just a $40 computer, ha! I will post details of Cole and my learnings and projects from time to time, so stay tuned. So, Installing the driver for the wireless was a pain. There was a ton of posts out there for older versions of the OS which made me dizzy. If you downloaded Raspbian 3.18 — which you is the current version for the Raspberry Pi 2 — there is a driver for the TP-LINK TL-WN725N included in the image so you don’t need to download one; however, it needs a firmware update before it will work.